If you are looking for information on growing lemon trees in Arizona, this post is for you! Arizona is a great place for anyone to grow a citrus plant, which is why a lot of commercial growers and home owners produce high quality fruits. You can actually grow some of the best citrus fruits in the world using Arizona’s dry and warm climate. Mandarins, Pumelos, Kumquats, Limes, Lemons, Tangerines, Grapefruits, Tangelos, Blood Oranges, and Oranges are just a few of the citrus fruits that will thrive in Arizona. There is a large variety of available citrus to be grown, today we will focus on just lemons and how you can grow them effectively. 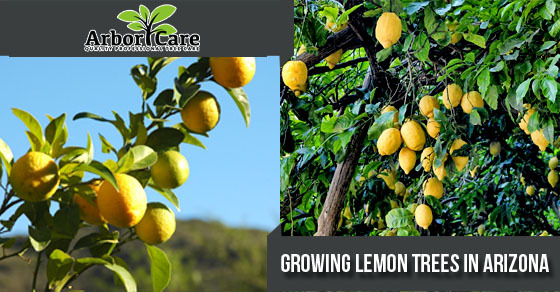 We will take time to outline the information and tips about growing healthy, strong, and fruitful lemon trees. The most important and first decision that should be made when planting lemon trees is where you want to plant them and how much sun exposure they will get. Lemons are sensitive to cold temperatures, which why having full sun exposure is vital and needed for them to grow right. You will find that the best planting is on the Southside of your home most of the time, depending on coverage from large trees that may be there. While it isn’t a problem in Arizona, frost can destroy your lemon tree and a good way to guard against this is to plan the lemon trees close to your home. You need to make sure that your tree is moist when you plant the tree is vital, after you plant the tree you need to water it in a deep and slow fashion once a week during the summer and twice a week during the rest of the year. This is because citrus trees that are established in soil will do well when the soil is slightly dry between watering. If you believe that there is a chance for frost, then you need to cover the young lemon trees. Frost cloth and burlap are great for protection. Never use plastic to protect the tree from frost as it is quite inadequate, so if you don’t have frost cloth or burlap, you can use a blanket or sheet will protect them well. Once the temperature has rose above freezing, uncover the trees and let them soak up the sun, until the temperature drops again. A good way to help citrus trees like lemons is to grow them in a pot on your patio. They can flourish and produce fruit when they are potted. This is effective because you can bring your pots under the patio or indoors when it begins to freeze. The best way to fertilize your lemon trees is to fertilize them 3 times a year, its best in February, May, and then September. Organic, slow release fertilizers are going to be best. Lemon trees will adapt quite well to desert soil to the extent that they can thrive in soil from the yard, as long as it isn’t rocky. A good way to keep the tree roots moist is to put down a layer of mulch that goes to a drip line used for watering. If you have rocky soil, do a mulch mix o 70/30 which will enhance the lemon trees ability to thrive and soak up nutrients. While the citrus plants can adapt to most soil, lemon trees prefer a soil that is well drained and slightly acidic. The preference of well-drained soil helps by allowing you to plant your tree above ground level. This can be done by digging a shallow hole that won’t swallow the whole root on the bottom of the tree. Replace the soil and add mulch will create an almost perfect environment for your lemon tree. Your lemon tree will require a lot of sun to produce fruit and high temperatures will be the key to producing sweet fruits. This is true for lemon trees. If you prune the tree to expose the trunk, then you need to consider painting it white or wrapping the trunk to keep it from being sunburnt. If you plan to paint it, use tree paint of dilute household paint with 50% water. If you see leaf scorch at the end of the summer, that is normal and is not a red flag. The scorching will appear more on younger trees, which can be avoided by shading them during hot months. This is helpful, but not really needed. Lemon trees will thrive if they are potted. This allows them to be great indoor plants. The same type of principle that applies outdoors will apply to indoors as well, which it comes to a plant environment that is well drained and has room for growth as well as having some acidic soil. Indoor lemon trees will normally grow no taller than 5 feet. Ensure that your lemon tree gets plenty of sun as they will need a full day to grow to their potential and produce a quality fruit. You may place the tree outdoors during warm times and bring them in overnight or once the weather gets cooler. Doing this will help to produce fruit which they also get into a natural rhythm of night and day. Putting them outside also lets them be pollinated. The best lemon tree that adapts to Arizona climate is Eureka Lemon Trees. These trees produce great lemons that have few seeds. The lemons also hold to the tree well, which mean they don’t fall off easily. Lisbon Lemon Trees also give great lemons and are great for desert climates. They grow well during winter. Meyer Lemon Trees are small and look like shrubs due to their foliage. They have a good sugar level which makes it a favorite of chefs. Pink Lemon Trees grow well in the desert climate and add a unique look with white and green foliage. Need Professional Tree Care Services In The Phoenix Valley? If you are looking for tree care tips or need tree services in Phoenix, give the expert tree professional at Arbor Care a call today at 480-797-5566. The limbs on the tree gave started to dry up and die. This has been a very health and fruit producing tree. I always fertilize the tree 3 times a year, Feb, May and Sept. After this summer is the worst the tree has look. I want to save this tree is this possible. The Orange tree and manderan tree are on the same sprinkler line and look very healthy. I trimmed the limbs that were dead, deep soaked it and fertilized it. HELP. Dr Lopez.